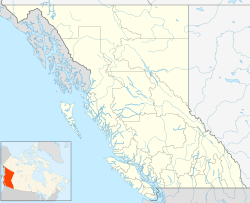 Rossland is a city in the West Kootenay region of British Columbia, Canada. Tucked high in the Monashee Mountains, Rossland is at an elevation of 1023 metres (3356 feet). Its population is 3729, though it fluctuates from season to season. The population is at its peak during the winter. Rossland has been known as the 'Mountain Bike Capital of Canada' since 1993 when it was awarded this title[by whom? ], with an extensive trail system radiating from the outskirts of the town. Also nearby is the multi-peak ski hill, Red Mountain Resort. The origin of the toponym Rossland comes from the name of a miner, Ross Thompson, who staked a claim in 1890. He had tried to call the city Thompson, but he was advised that there was already a town with that name. In 1897, as a result of a gold rush, Rossland for a time[when?] was one of Western Canada's largest cities. A number of historic buildings survive from this time. By 1907, Rossland was home to a local branch of the Western Federation of Miners. In 1929 Doukhobor firefighters were sent from Rossland to Gold Creek Basin in Washington State to fight a forest fire. Two of the men discovered a Lost Mine called the Lost Doukhobor Ledge. The Rossland Court House was designated a National Historic Site of Canada in 1980. Rossland is home to CHLI-FM, Rossland Radio Co-op, an internet-based community radio station which has currently applied for, and was granted, a low-power FM license with the Canadian Radio-television and Telecommunications Commission (CRTC) at 101.1 FM. Rossland is served by two newspapers. One is The Rossland Telegraph, an online only full-service paper, founded in August 2008. In July 2010 the "Rossland News" was opened and is both online and currently distributes 1,200 papers throughout the town. School District 20 Kootenay-Columbia operates public schools in Rossland. The Conseil scolaire francophone de la Colombie-Britannique operates one Francophone school: école des Sept-sommets primary school. ^ Scott, Gord (16 February 2011). "Pioneering spirit lives at Red Mountain". Edmonton Journal. Retrieved 17 February 2011. ^ "Portland Strike Fund Report". Industrial Union Bulletin. 1 (8). 20 April 1907. p. 3. ^ Rossland Court House. Canadian Register of Historic Places. Retrieved 29 January 2012.